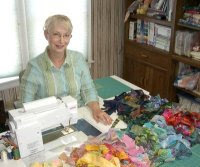 Most quilters out there own one or more cats. 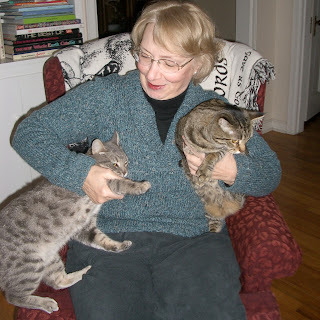 Somehow, cats and quilts just go together, so I must share with you some of our adventures with becoming a 2-cat household. Gianni is settling in, and right now, the two cats are sleeping less than 6 inches from each other on the floor of my office. This is the first time I've observed them this close together without hissing and growling, so I'm very impressed and encouraged. Integrating Gianni into Sally's territory has been exciting at times, tense at others, and lots of fun, too. I just have to share some photos with you here. Last night after I went to bed, I heard lots of racing throughout the ground floor of the house. I snuck downstairs to make sure everyone was safe, and observed first Sally chasing Gianni at break-neck speed, then Gianni chasing Sally. Hardwood floors, and clawless front paws make for hazardous travel, kind of like trying to run on ice, but both survived and without either one getting cornered or screaming at each other. 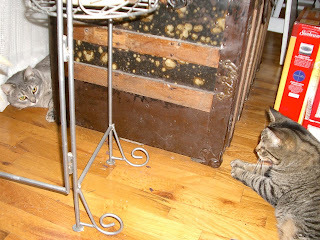 This morning, we had a great game of hide-and-seek in the living room. The biggest losers were my violets. 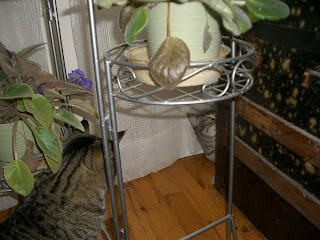 I now have lots of leaves to propagate them, thanks to two lively hiders and seekers. It seems as long as there is the appearance of a barrier between them (Sheer curtain, bath tub wall, legs of a chair, etc.) Sally is OK being in close proximity to Gianni. Gianni has never actually been aggressive with her, except if he is cornered, then he will let her know who is REALLY the boss of this place. But for the most part he's been quite a gentleman. Gianni S. Kitty and Sally T. Cat (Look at how very similar they are in appearance......if the room lighting is low, I sometimes can't tell which is which.) Of course, there's the early morning routine we're still working on. 5 am: Sally jumps in bed to check to see if I am still alive. She does this by touching her nose to my nose, and me batting her away from my face. (I really don't like them in my face, and don't allow either of them much above my shoulders, ever!) Then Gianni hears the ruckus, and comes running. 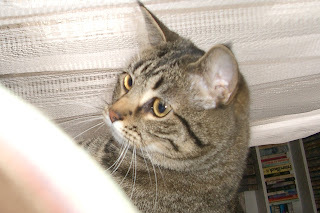 Now, he is a 'talker', and he mews loudly as he bounds on to the bed. Then there's a hiss and a swat, and both go running across the bed to Ken's side. 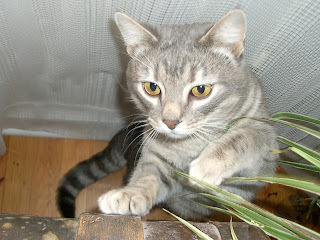 A few wild flails from Ken, and both cats are somewhere in the air above the bed, ready to land, clawed feet down. Hopefully, they land on the floor, not in my face. Once I am up and the cats are fed, I can return to bed for a couple more hours of much needed sleep. Sometimes, I just get out of bed for good, turn the heat up, and go to work. It's just much easier that way. Surely a satisfactory truce will be drawn and a routine will be learned, but for now, it escapes us. Hi, love the bias heart BOM, I have been diligently collecting them each middle of the month. 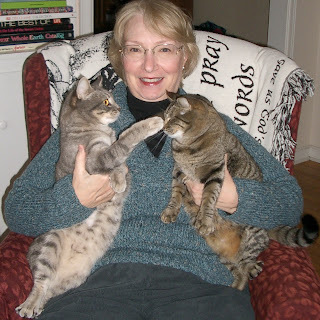 I was perusing your blog and came across the cat story. I had to look twice and go and check out to make sure my kitty was still here, down under. she is the splitting image of your girl. she is 15 and loves to be on the quilt when i machine quilt them. so when moving the quilt, its lift cat, lift quilt, reposition both and keep quilting. love cats and quilts. P.S. Ruth is my web designer, and former college roommate from a few years ago. 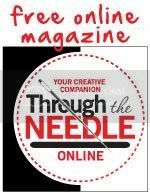 If you run across this blog, do go to her picasa web album and check out her marvelous photos of her new home in Arizona. I love your BOM. I love cats and violets, but how do you keep the cat hair off of the violets? I quit having violets because of the cats and their hair. The hair would kill them. Any ideas, I love violets. 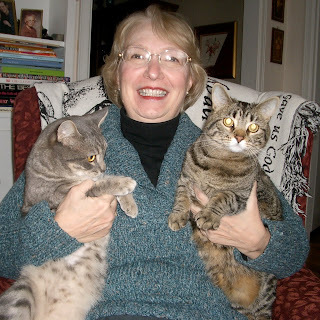 @ Rosemary: These two don't shed a lot of fur like their predecessor Jennifer the cat. 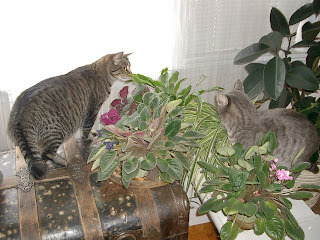 But Jen never paid attention to the violets, nor did she sit on the trunk to look outside. I've since had to move my violets to the kitchen windows because Gi especially likes to play with them.